“Wow, closing costs are high in Delaware,” one of our clients recently commented. During the day we had visited with on-site salespeople at several of our new home communities. In builder speak, anything not included in the actual purchase price of the home is referred to as “closing costs.” Well, this is not entirely true. I like to use the analogy of dining out today. Do you remember when you ordered dinner and it came with soup, salad, and dessert? Today, you’re lucky if your entrée even comes with vegetables and a potato. It’s kind of the same thing with a new construction home in many new communities, especially the new active adult communities full of amenities. What are the Buyers’ Closing Costs in Delaware? If you are buying an existing home, the 4% is split between the Buyer and the Seller. BUT, if you are buying new construction, you may be responsible for the whole 4%. If you are financing, the lender will require prepaids including homeowner’s insurance for several months and property taxes for 6 months. These are placed into escrow accounts, usually by the lender. Pro-rated HOA or condo dues and fees. Capital Contributions, if applicable. This one-time fee can range from hundreds to as much as $5,000 or more and is due at settlement. In most planned communities or active adult communities, the capital contribution is applicable. Water and Sewer Impact Fees. These fees apply only to new construction and are paid once. The developer or builder may pass on the cost of connecting to water and sewer. These fees also vary greatly. I have seen numbers from $3,000 to $8,000—depending on the community. 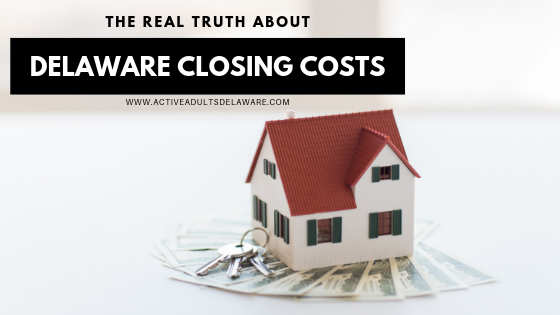 So, if you hear someone say: “Closing costs are high in Delaware,” ask them “Compared to what?” If they are comparing closing costs on a new construction home in a community with all the bells and whistles to their last home they purchased 20 years ago or more, that’s comparing apples to oranges. Do you have more questions about buying a home in Delaware? Contact one of our experienced Active Adults Realty agents, or request your copy of our new Delaware Home Buyers Guide today!